Sore throats, fuzzy heads, nausea, and tiredness — most people have been unfortunate enough to experience the flu and its symptoms at least once in their lives. Each year on average, between 5 and 20 percent of the U.S. population comes down with the flu. This can mean days, even weeks of missed work — costing employers the time and health of valuable employees. Although the timing of the flu is unpredictable, the virus usually peaks between December and February and can continue into late March. Luckily, getting the flu shot can be a markedly effective defense against the virus. Last year, the CDC reported that the effectiveness of the shot was around 40 percent. However, the longer you wait to get vaccinated, the higher your chances of getting infected. The standard vaccination period for the flu shot is between October and November, with shipments beginning in August. The vaccine itself takes about two weeks to become effective. So when it comes to flu prevention, earlier is always better. Avoid a company-wide epidemic by hosting a vaccine clinic for your business. The flu can easily spread throughout the workplace, and workers infected with the virus may not even show symptoms for a few days while they are contagious. If an employee comes down with the flu, he/she may have to take three-to-five days off from work, although productivity could be impacted for two weeks while they fully recover. Keep your productivity high, even in the peak of flu season, by offering company-wide flu shots with a mobile flu shot event. You’ll have fewer workers out getting the shot at their doctor’s office or being home sick. Furthermore, showing that your company cares about the health of its employees can boost engagement and morale. Hosting a flu vaccine clinic is simple, especially when you use a medical company that already travels to work sites on a daily basis. 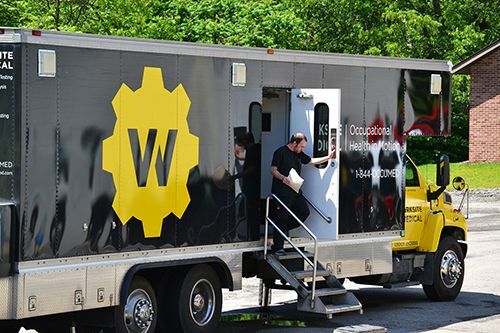 Worksite Medical has a fleet of mobile medical vehicles, and we will prepare the events to be quick, thorough, and without much disruption. Your workers can come directly into the vehicle to receive their vaccinations from experienced, trained medical technicians, then get back right back to work. Furthermore, if you’re near Ellwood City, PA or Belcamp, MD, you can send your team to one of our standalone clinics. 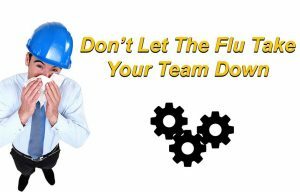 In just one day, your team can remain protected throughout the entire flu season. Contact Worksite Medical to book your mobile flu shot clinic today, and stay ahead of flu season. Are you already having us come to your job site? Save 10% on a flu shot clinic by adding it to your medical surveillance testing. Contact us today and mention this email to receive your discount! You must contact us by the end of 2018 to receive your discount.